NVIDIA has publically updated their roadmap with the announcement of the GPU family that will follow 2014’s Maxwell family. That new family is Volta which will use stacked DRAM, which will be connected to the GPU with TSV. GPU Technology Conference in San Jose. CEO Jen-Hsun Huang was visibly anxious to unveil the company’s Volta, their upcoming GPU targeted for a 2016 release. "Volta is going to solve one of the biggest challenges facing GPUs today, which is access to memory bandwidth," Huang told the attendees. Move up http://i.forbesimg.com t Move down The Volta GPU will introduce stacked DRAM which will deliver 1 terabyte per second of memory bandwidth. Huang didn’t provide a timeline for Volta’s release, but 2016 seems reasonable since Nvidia debuts new GPU architectures every two years. Huang said that Nvidia will be putting the stacked DRAM and the GPUs onto the same silicon substrate and inside of the same packaging before it welds that package to a peripheral card. 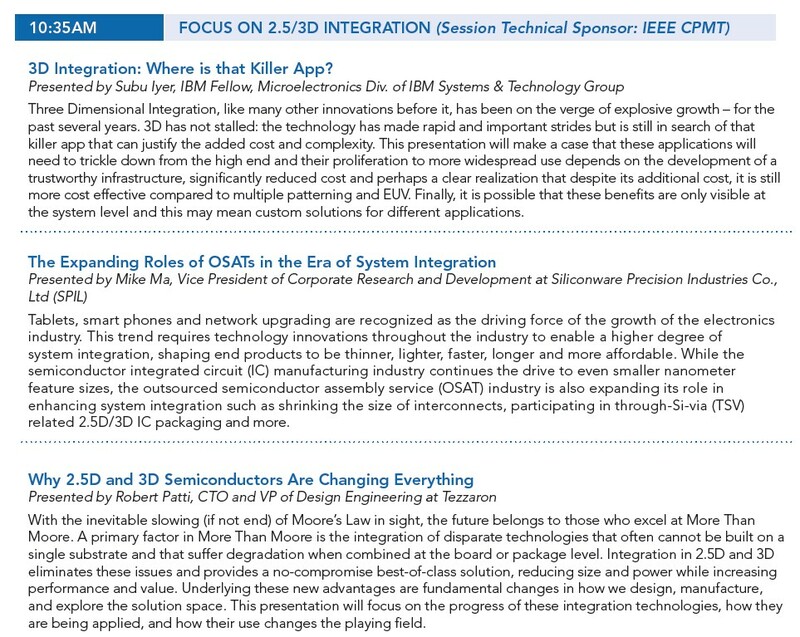 The IEEE 3D meeting 3DIC has rotated through Germany and Japan and is back in San Francisco this October 2-4 (link). Paper submission deadline is April 30th. 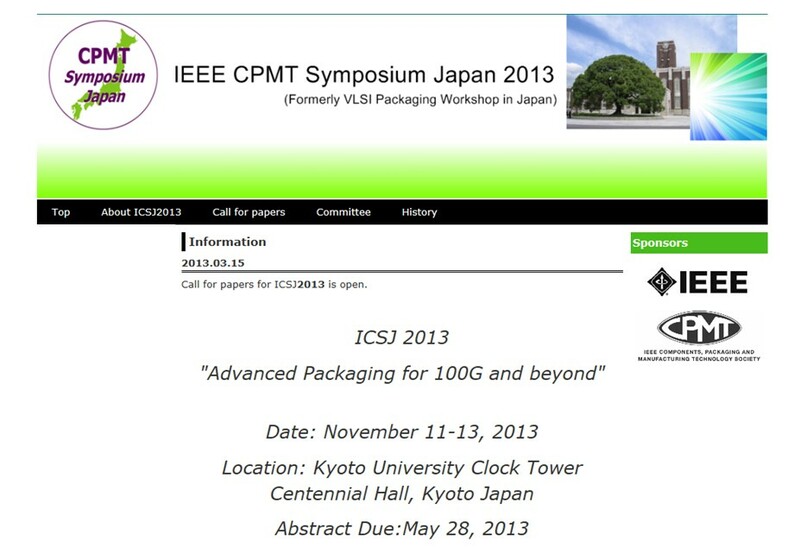 This years packaging and 3D sessions are co-sponsored by the Component, Packaging and Manufacturing Society (CPMT) of IEEE. 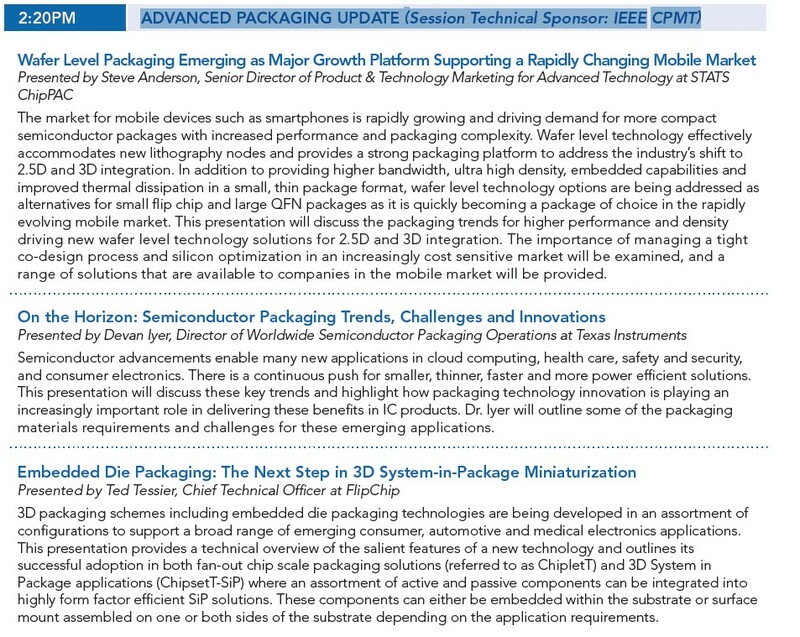 Apologies for the delay in covering the IMAPS device packaging conference this year. I normally get access to the manuscripts as I am leaving the show to insure timely coverage. This year that was not possible. IMAPS’ move of their office to the RTP NC area is causing further delays (they will soon be my neighbors), so I await the conference CD like the rest of the attendees. The word from Taiwan is that Doug Yu, who has been responsible for the R&D of exploratory technologies including FEOL, BEOL and 3D IC has been refocused on just packaging, especially their CoWoS 2.5D offering. 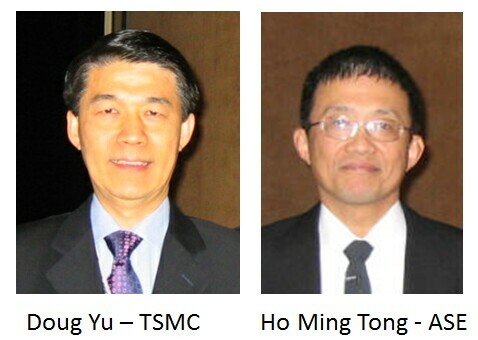 IFTLE thinks this move shows that TSMC is serious about expanding this business within their company. We also hear that Ho Ming Tong currently General Manager and Chief R&D Officer at ASE, who has been a strong supporter of 3DIC, and is actually credited with coining the phrase 2.5D, is moving further up the corporate ladder at ASE. 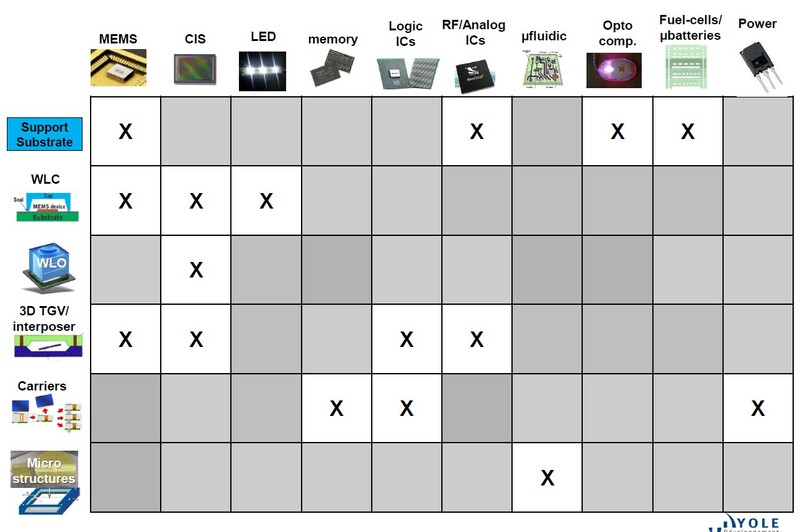 We have recently discussed Asahi Glass entering the 2.5D glass interposer market [see IFTLE 141, "100GB Wide IO memory; AGC GlassInterposers; Nvidia talks stacked memory"] and the general use of glass interposers for 2.5D fabrication [ see IFTLE 54 ,"2011 ECTC and GlassInterposers"
Yole Developpement’s Amandine Pizzagalli has just issued a report "Glass Substrates for Semiconductor manufacturing," where she has examined the potential applications for glass in wafer level packaging and reported on the current and projected market size. 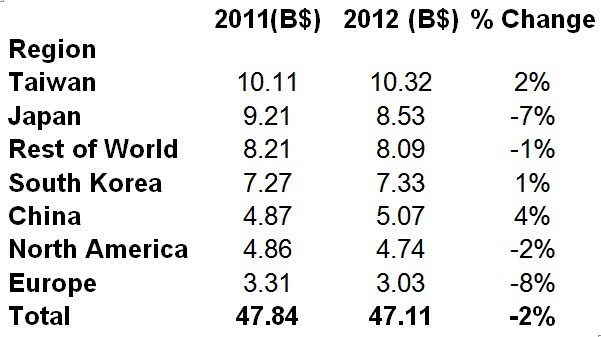 A sample of the report can be found here [link]. The functions that were examined include: carriers for thinning in 2.5/3D; capping layers for CMOS image sensors, wafer level optics, structural substrates and wafer level capping. A grid of application vs function would look something like this. 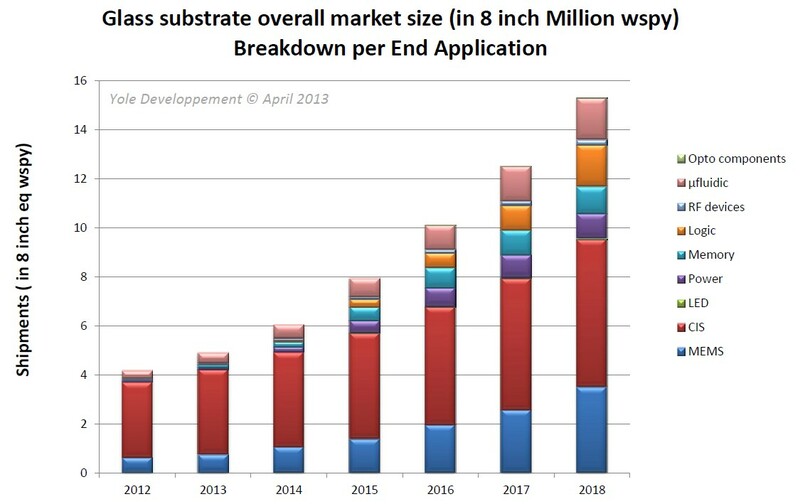 The market breakdown by end application is shown below with MEMs and image sensing being responsible for over 50 percent of the market for more than the next five years..
Total market glass market is reported to be $158M in 2012. 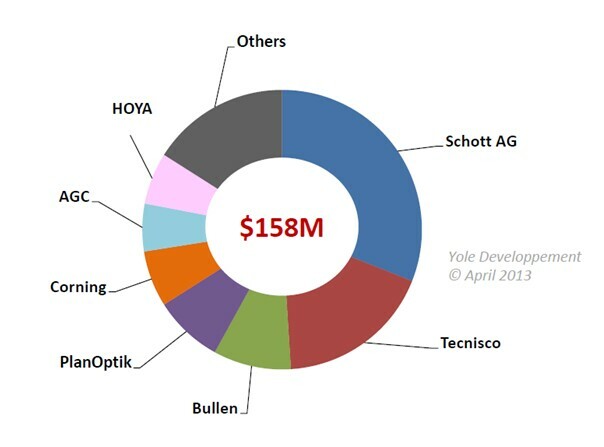 Schott (Germany) , Tecnisco (Japan), PlanOptik (Germany), Bullen(USA) and Corning (USA) reportedly share 70 percent of the market, driven mainly by demand for WL capping [CIS application (see below)]. CS wafer level glass capping is shown below . A year ago [see IFTLE 102, "3.5D Interposers tosomeday replace PWBs” - TSMC; GF engaging with 3D customers; Intel predictsConsolidation"] GlobalFoundries (GF) CTO Bartlett announced the installation of TSV production tools for the company’s 20nm technology platform and announced that "the first full flow silicon with TSVs was expected to start running at Fab 8 (Saratoga NY) in Q3 2012 with mass production expected in 2014 and the 2.5D line ( their 65 nm Fab 7 line in Singapore) had a similar time schedule as the 3D line in the United States." Last week, GlobalFoundries announced its first functional 20nm silicon wafers with integrated through-silicon vias (TSVs). 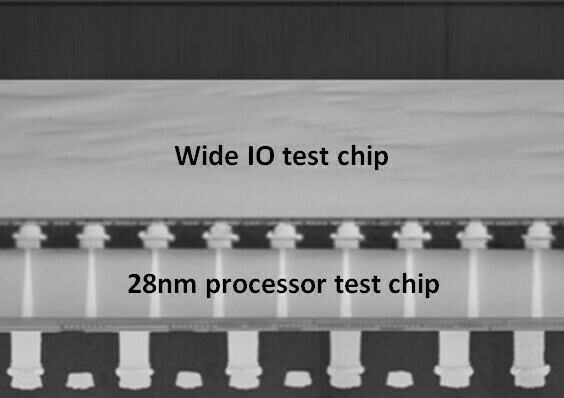 At its Fab 8 facility in N.Y., the silicon foundry vendor manufactured TSV test wafers using their 20nm-LPM process technology, and at Fab 7 in Singapore, the company demonstrated a 65nm 32mm x 26mm interposer test vehicle for 2.5D chips. Both 2.5D and 3D are set for a 20nm introduction, full qualification by next year and non-early adopter production in 2015. They are using a 6 x 60 um vias middle, copper TSV as shown in the figure below. Interposer size is limited by reticle size i.e. 25-30 mm. Dave McCann, VP of packaging technology at GlobalFoundries, reports that GF is taping out a 3D design for an undisclosed customer and is working with two others on 2.5D. "2.5D is already here," he added. Several 2.5D test structures were shown that were collaborations with Amkor. While foundries TSMC and Samsung [see IFTLE 133, "SEMI ISS 2013 Comments from Samsung, GF,Intel and others"] are both offering turnkey solutions, GlobalFoundries and UMC are supporting a partnering ecosystem where they will handle the traditional front-end steps and the "via creation" process and then will hand off the traditional backend steps such as temporary bonding/debonding, grinding, assembly and test to traditional packaging houses such as ASE, Amkor SCP and SPIL. A year ago, GF announced hopes of shipping 28 and 20nm 3D chip stacks in 2014. 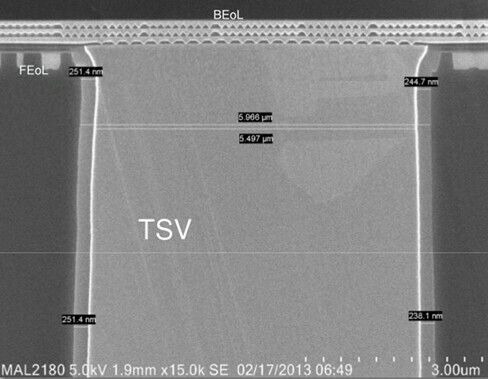 Now, GF states only the 20nm chips will be used in stacks and they may not ship in volume till 2015. This past fall [see IFTLE 123: Intel's Bohr on3DIC] IFTLE reported rumors that Intel would be using TSV stacked DDR4 memory in their Haswell-EX platform for enterprise computing. Haswell is the codename for the successor to Ivy Bridge architecture. Intel is expected to release 22nm CPUs based on Haswell around June 2013 according to leaked roadmaps. 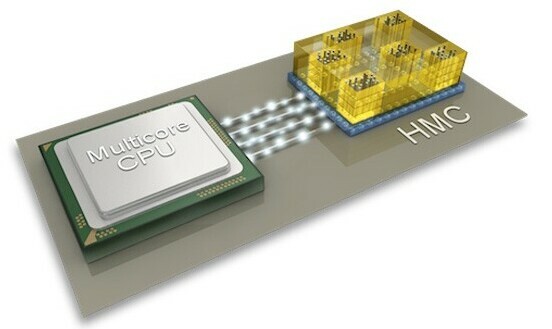 Current rumors have it that the Haswell GT3 will be the introduction point for 2.5D stacking and interposers. Semiaccurate [link] reports that Intel codename "Crystalwell" is not L4 cache on package but rather is GPU memory on an interposer. They indicate that the GT3 variants of Haswell will have 64MB of on-package memory connected through an ultra-wide bus. IFTLE must ask whether these Haswell "requirements" can be met with the newly described LPDDR3 and LPDDR4 solutions, which do not use TSV technology. 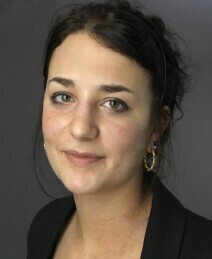 You are currently browsing the Insights From Leading Edge blog archives for April, 2013.